NEW YORK (CNNMoney) -- New York City's government agencies are sitting on a deep reservoir of data -- a geeky treasure trove of information on topics ranging from crime reports, building complaints and traffic stats to public health. The city doesn't have the resources to unlock all the potential buried in that data. So it appealed to those who do: The city's tech entrepreneurs. NYC turned them loose on more than 350 public data sets, and asked developers to invent Web and mobile applications that would use the data in intriguing ways. More than 50 teams took up the challenge. Want to play a game of basketball? Try Sportaneous, a location-based technology that lets you join in on sports games around you. Wondering if the restaurant you're eating at has rats in its kitchen? Download DontEat.at, an app that sends a text message when you check in to a restaurant that has a risk of being closed for health code violations. 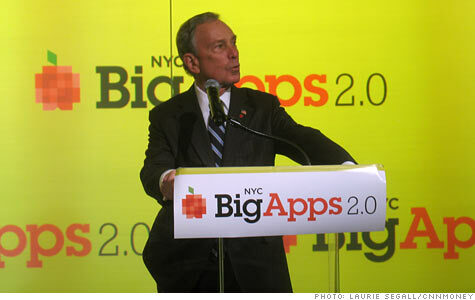 Those app creators and 12 other finalists gathered Thursday evening to hear Mayor Michael Bloomberg announce the winner of NYC BigApps 2.0, the city's second annual data competition. This year's $10,000 grand prize went to Roadify, an app that sends alerts about subway, bus, and driving conditions. Users can add comments and real-time updates as they commute. In a tech world that's becoming increasingly bubbly, $10,000 is pocket change. The real prize is publicity and exposure to some of the city's top politicians, investors and entrepreneurs. The crew from MyCityWay, last year's winner, says the competition helped them turn their application into a business. "We were really motivated and quit our Wall Street jobs," MyCityWay co-founder Archana Patchirajan said. Since taking home the grand prize, the company has expanded from New York to 50 cities, including Germany and London. It recently the crew secured $5 million in funding from FirstMark Capital, IA Ventures and BMW's new i Ventures fund. This year's BigApps entrants were judged by a panel including Betaworks CEO John Borthwick, Twitter co-founder (and newly named product chief) Jack Dorsey and Foursquare co-founder Naveen Selvadurai. It's all part of Bloomberg's push to spur tech entrepreneurship in New York City. In his remarks Thursday night, Bloomberg called intellectual capital New York's ace in the hole. "Our business strategy is to make New York a place where those people want to come," he said. By opening up vast amount of data, the city hopes to attack two challenges at once: seed new local businesses, and build a better New York. "As you're moving to an era where social media is increasingly important, there's no better way to test the network effect then in New York City," New York City Economic Development Corporation President Seth Pinksy said. "It's a great example of crowdsourcing for the purpose of economic development." David Mahfouda, who worked on a startup called "weeels," wanted to create an app that would make transportation around the city less of a headache by allowing people to order cabs in real time. He figures any technology that takes off here can scale elsewhere. "One of the reasons we're in New York [is that] this is one of the best places to test the networking," Mahfouda said.